The Kitchen is one of the East Wing additions you can build to expand your home from the Main Hall. 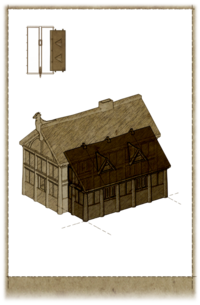 The following is a list of possible furniture items and decorations which can be added by using the carpenter's workbench in the Kitchen. It is not necessary to purchase or build all furnishing options; you can pick and choose to better dictate style. However, all furnishing options are in a pre-arranged location and only ingredients and standard items can be moved. Oftentimes, the name of the furnishing option only indicates the primary piece of furniture, and actually includes various additional containers and accessories. A number of miscellaneous items are added with various furnishing options, but only notable items are specified on this table. This includes usable containers, rare ingredients, any food or ingredients on hanging racks, items which can be used for crafting activities, or items which were newly added by Hearthfire. Though they are added to your home, other items and ingredients are not listed here. Note that the icon displayed for each furnishing option does not necessarily represent what is actually built in your home. Barrels Sawn Log, Nails, Iron Ingot One barrel and one sack in northwest corner. One barrel and two sacks in southwest corner. Barrels Sawn Log, Nails, Iron Ingot One barrel in southeast corner. One barrel, one "Fish Barrel", one sack on east wall, south side. Adds two sacks of flour. Cupboard 2 Sawn Log, 4 Nails, Iron Fittings West wall, north side. Adds one bottle of Argonian Bloodwine, one apple dumpling, and one snowberry crostata. Cupboard 2 Sawn Log, 4 Nails, Iron Fittings East wall, south side. Adds one strong box. Cupboard 2 Sawn Log, 4 Nails, Iron Fittings East wall, north of center. Adds one potato bread, one jug of milk, and two sacks of flour. Low Table Sawn Log, 2 Nails West wall, north of doors. Low Table Sawn Log, 2 Nails West wall, south of doors. Adds one honey, two jugs of milk, and a "Churn" which provides butter. This "Low Table" is an "End Table", usable for storage. Round Table Sawn Log, 2 Nails East wall, north side. Adds one jazbay crostata and one salmon roe. Square Table and Chairs 2 Sawn Log, 4 Nails East wall, south of center. Two chairs. Adds one juniper berry crostata. Square Table and Chairs 2 Sawn Log, 4 Nails West wall, north side. Adds one small pearl, one set of steamed mudcrab legs, and a sample of butter. Washbasin on Stand Sawn Log, Nails, Iron Ingot South wall. Tall Shelf 2 Sawn Log, 4 Nails South wall, west side. Wall Shelf Sawn Log, Nails North wall, center. Adds one jug of milk. Chandelier, Small Iron Ingot, 3 Goat Horns, Iron Fittings South side. Chandelier, Small Iron Ingot, 3 Goat Horns, Iron Fittings North side. Fireplace Sawn Log, 4 Quarried Stone East wall, center. Adds one sack, a cooking pot, one bottle of Surilie Brothers wine, and one set of mudcrab legs. Hanging Rack Iron Ingot, Iron Fittings East wall, south of fireplace. Hanging items: two rabbits, one pheasant, and one garlic braid. Hanging Rack Iron Ingot, Iron Fittings East wall, north side. Hanging items: one dried frost mirriam and two salmon. Hanging Rack Iron Ingot, Iron Fittings West wall, north side. Hanging items: one dried elves ear and one garlic braid. Hanging Rack Iron Ingot, Iron Fittings East wall, south side. Hanging items: three salmon and one garlic braid. Mounted Elk Antlers Large Antlers, Leather Strips West side, center of doors. Oven 2 Clay, 3 Quarried Stone North wall, center. Wall Sconces (2) Iron Fittings, Goat Horns West wall, either side of pair of doors. Mounted Horker Head Leather Strips, 2 Horker Tusk Top center of fireplace. This furnishing option only becomes available after crafting the fireplace. For recipe information related to baking, see this page. The Mounted Elk Antlers may fall off the wall when you close the doors. Try waiting at a different location until the house respawns.